It is very early to be thinking of Christmas, given this sweltering heat! But I wanted to share some amazing BRAND NEW Stampendous stamps again. This is a layout I made for CHA Summer 2012. These have got to be my favorite Christmas stamps this new release! The yellow poinsettia at the top of the layout – it’s a background stamp that I colored with Copic Markers. So versatile and love how rich it makes everything look. That sentiment up top – hilarious and the cutest EVER! Check it out at your LSS soon! Head on over to the Stampendous project page to see instructions for this layout. I always feel very nostalgic at the start of a New Year. Don’t get me wrong – I’m excited for a new beginning; I’m not used to writing 2012 in print yet but I’m sad that another year has gone by. So this 1st challenge of the new year at CMC challenge is aptly themed “RETRO” – use BLACK, PINK/HOT PINK and WHITE. The Sponsor this week is GuyLou’s Inimitability. Don’t forget when you play along the entire month, you are also entered into the monthly drawing for the shopping spree at Oozak. How can you beat two prize opportunities – head on over to be inspired and get to coloring. Use any image you want as long as they are colored with Copic Markers or Promarkers. Your card must also be newly created. I just learnt how to color my own retro clothes at Color Me Creative Copic Class 5 - it’s full of many more fun techniques to learn and this is also Suzanne’s last Copic class. So come check it out. I have news! While this is my last post for Cardabilities for the year and my 1st term; Karan has invited me to continue on for a 2nd term!! yeah yeah yeah! This is a very inspirational design team for me. Karan’s sketches makes it so easy to just focus on the fun papers and embellishment and coloring of the card and I really enjoying using her sketches! Pay attention to the box please. Yup every box is different. I got these white boxes from TPC Studio but I discovered you could get them at Michaels for almost half the price of what I paid for them…Grrrr..too late now but I know better for next time. Covered all the sides with patterned paper (these are from Webster’s Pages, Graphics 45 and October Afternoon). 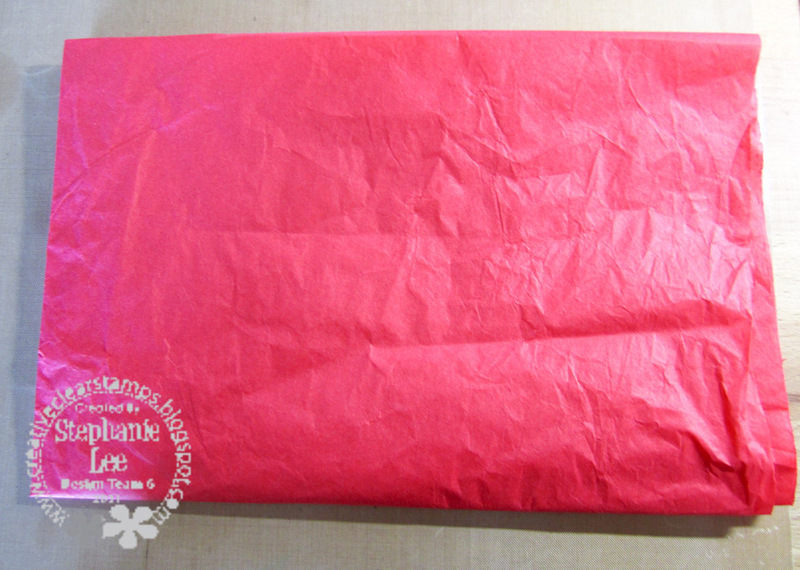 Cut 2 3” square diagonally into triangles to decorate the top of the box. I used different Stampendous stamps for labels and tags for the boxes. Seen here are From the Kitchen Perfectly Clear Stamp set and Cling Poinsettia Silhouette. From the Kitchen Stamp set was colored with Copic Markers and Cling Poinsettia Silhouette was embossed with Stampendous Vintage Embossing Tinsel (Vintage Mahogany for the poinsetta & Vintage Olive for the leaves). Here are a few up close look. Welcome to another Creative Vision Design Team Themed Blog Hop. The hop today is VERY special because it is the team’s final hop. PLUS we have a guest designer on the company blog PLUS Laura Lou Who goes LIVE with THING 1 and Whoville ACTION NEWS! Yes the GRINCH GAME begins TODAY!! The holiday season is always a time for giving. That’s what our family try to do every year. So the blog hop theme is suitably appropriate for us - “GIFTS”. Remember, it’s more bless to give than to received – have a great season of giving this year! Welcome to another Creative Vision Team Themed Blog Hop. Today we are sharing a themed project, “Tags”. Tags are something I regularly make but don’t photograph it as much – just because a tag to me is like a test surface. To test out new techniques, new layouts, new materials, new style outside my comfort zone before it makes it into a larger surface like a card or a layout. But with Christmas right around the corner we hope our creations inspire you to create some tags of your own! As you hop hop hop your way around, make sure to become a Creative Vision Blog follower if you are not already, (you have to be a follower in order to win) then leave me some love for a chance to WIN a $10.00 Shopping Spree to the Creative Clear Stamp Store! The winner will be announced on Thursday at the Creative Vision blog. You can also win a chance at being our Guest Designer!! The tag I will share with you has a more vintagey feel to it – not a style I am supremely comfortable with. But I do like the look of it when someone else (like Tim Holtz) does it. So I like to dapple in vintage designs sometimes. Yup, I cannot get away from my pearls. Enjoy my vintage tag. Papers are from Websters Pages, Poinsetta is from Making Memories (discontinued) and the rest of the embellishments are from Tim Holtz. The sentiment I used is from Creative Vision Wishing You Set (CV0087). On with the hop … but don’t forget to become a follower of Creative Vision’s blog and leave me some comment love. It could make you a winner!! 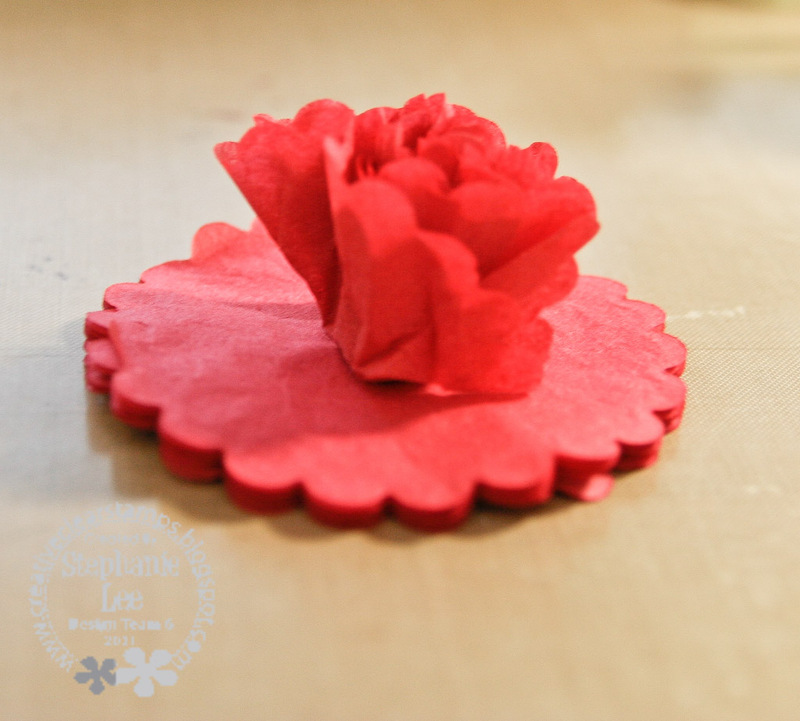 For today’s Creative Vision post, I am sharing a tutorial on how to make a handmade flower. You know those shabby chic cards you see with handmade flowers, I love them and have always wanted to learn how to make it. 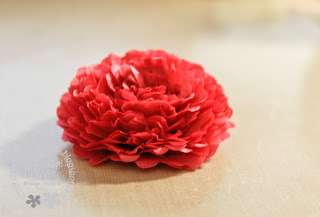 When browsing the web, I found this lady who makes these really nice scalloped flowers. Her site is here. Her flower is gorgeous but since I have 2 left foot, I adapted her flower and made it foolproof for me. Scalloped punch (or scalloped die) – size of scallop determines size of flower. 1. 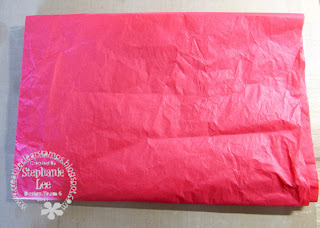 Fold tissue paper in half and continuing folding it in half until you get about 12-15 layers. 2. 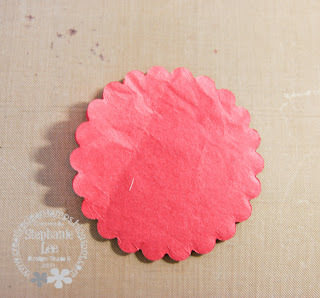 Punch out a scallop from your folded tissue paper. 3.Punch two small holes in the center and thread twine through the holes and tie a knot. 4. 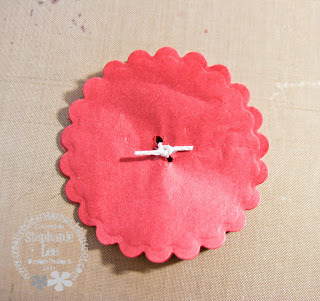 Flip the knotted scalloped circle over and start gathering each layer of tissue towards the center. 5. 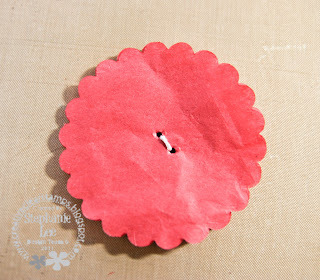 Once all the layers are gathered, start pulling layers down one by one (starting from the outer layer) to form a flower. Tada!!! You have your handmade flower. See I told you, couldn’t be easier than that. And very cheap too – a flower that looks like you actually bought it. Here is the card I made with this flower. I used the “CV0087 Wishing You” stamp set from Creative Clear Stamps. Have a fun and creative rest of the week! I sure felt creative after making a flower from some bits of tissue paper I had laying around.